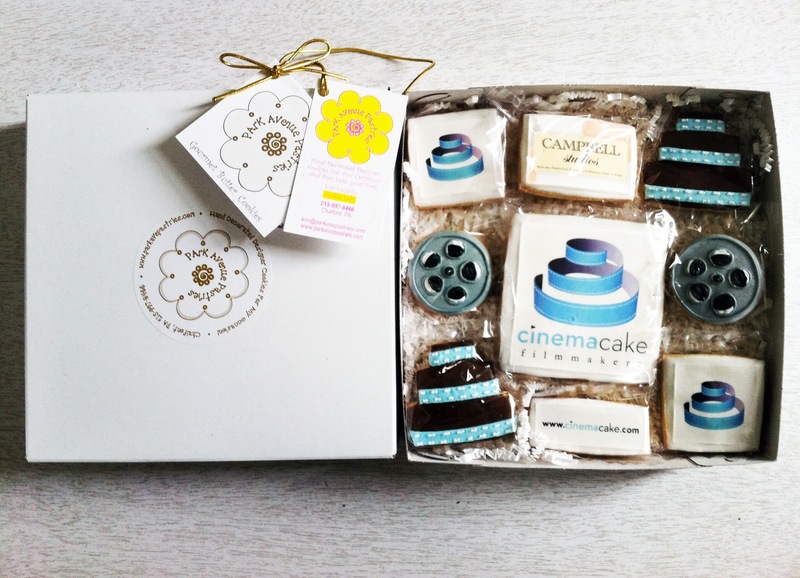 ...if Cinemacake wasn't so good a making Films, they could go into PR! I picked up the mail yesterday - which is usually kinda sad...bills, junk mail, you know what I mean. But there was a little package this time. Hmm. I don't know anybody in Chalfont. So imagine when I cracked that baby open and two of my favorite things were inside - Pastry and Cinemacake! That's right - a little treat from Dave and Sheryl. Perfectly formed, not a single one broken, with each of our logos on it Butter Cookies! Now, as a company with 'cake' (another one of my food groups) in their name - you might have thought I would have said they should be Bakers. But they would have had to duke it out with Kim at Park Avenue Pastries. And really - if we all just let people do what they do best, the world would be a better place. Kim is amazing. Great ideas, great sense of style and most important - tasty (cookies that is!) There is information on her website regarding the fresh factor and it is suggested that we "enjoy them within two months of receiving them." I practically fell off the couch laughing, but another one of those buttery treats would have been in jeopardy - no way these babies are making it through the weekend! Thank you Dave & Sheryl. Always a pleasure! Thank you Kim, I look forward to working with you soon!